Movie Monsters. The magazine had printed a scathing, negative letter to the editor about Trek in its issue of Dec. 1974 (You can see that one here). And Trek fans were so incensed they protested mightily. The magazine responded with this very positive article about the best Trek had to offer as opposed to Lost In Space among others. It’s fun to see how the article addressed the growing popularity of a canceled TV show as it began its resurrection. I’m sure at this point they never would have thought that Roddenberry’s ‘oddball creation’ would become the rich franchise it is 50 years on! There are some funny mistakes here too, like incorrectly identifying Michael Ansara (Kang) as Steve Ihnat (Garth) (and they spelled Ihnat wrong with an extra ‘t’) ! Also, why is a space station with no connection to Trek on the front page? 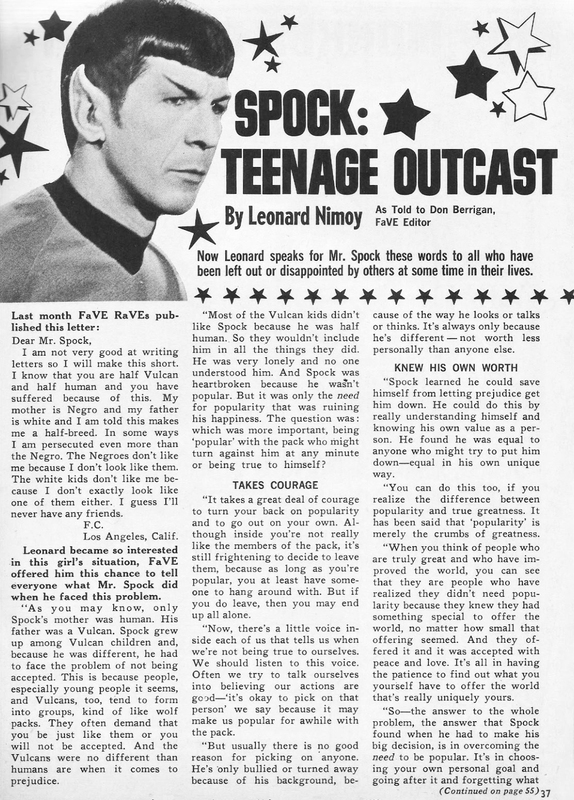 Here’s today’s flashback: From teen magazine FaVE in the 1960’s, Nimoy explains how Spock was a teenage outcast, and addresses the stigma of being bi-racial. A good lesson in self worth! (And a great gesture by Nimoy) I bet a lot of kids appreciated this.